Spiderman, Superwomen and the Incredible Hulk; they all exist as fictional characters in comics and films, but can they exist in real life? The answer’s yes and we’re going to tell you how. Meet Indy Singh, practice owner and superhero dentist at Cathedral Dental. His mission - his purpose - is to make people in Bury St Edmunds and beyond smile, whether it’s choosing a bespoke Spotify playlist during a treatment or an experience in the #ShareYourSmile photo booth. Step 1 - lets start with the practice No superhero is going to achieve their mission if the dentist hub or place lacks personality. At Cathedral Dental, Indy’s renovated the entire practice to create a fun and enjoyable place to be, added funky artwork throughout and recently invested in a ‘share your smile’ photo booth where patients can share their smile makeovers on social media after treatments. It’s more than just a practice, it’s an experience and one that will make you smile inside and out, and most importantly when you leave the practice doors. Step 2 - unique talent There’s more than just one superhero, it’s about the team. Think real-life Avengers. Since the practice opened in 2008, Indy’s been investing in superhero staff to give the dentistry a strong personality as well as expertise. In the last six months, Cathedral Dental has brought new skills to the town, including two leading dentists, an experienced dental nurse and an additional receptionist to manage the growth in patients. All new members of staff bring something unique, adding to the character of the business. Step 3 - share knowledge It’s all well and good being an innovative expert in your field inside the four walls of your practice or office, but sharing your knowledge and experience with your patients and the industry is key. Cathedral Dental runs various health awareness campaigns, boosting customers well-being and most importantly their smile. Customers can win smile makeovers, keep up-to-date with the latest treatments at the practice and find out how to look after their oral health outside the dentistry via Cathedral Dental’s digital channels. Marching to his own beat, Indy Singh invites you to discover more about how to become a superhero at www.cathedraldental.com or find out about his Salute Your Smile health campaign on www.indytheexpert.co.uk. 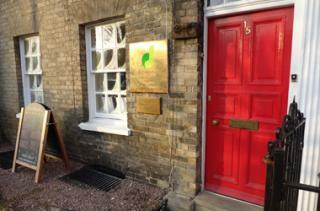 If you would like to meet the team and book an appointment, give the practice a call on 01284 705637.